Cornice Box or Valance: Which Style for Your Home? Home Design & Fashion Trends Cornice Box or Valance: Which Style for Your Home? If your significant other has given you free reign to design your perfect home – be sure to make your windows the topic of conversation at your next dinner party! No home is complete without elegant draperies to match the rest of your home’s interior design. 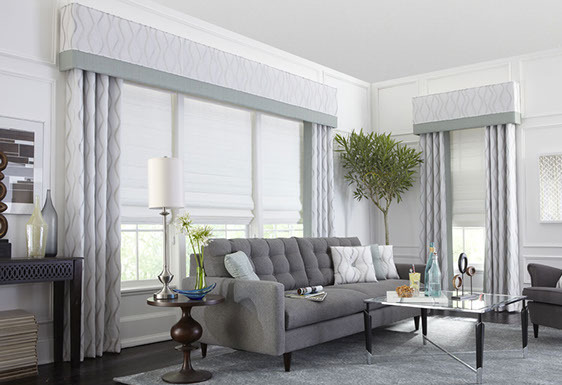 The best way to add elegance is with a top treatment like a valance or cornice box from Horizon Window Fashions. 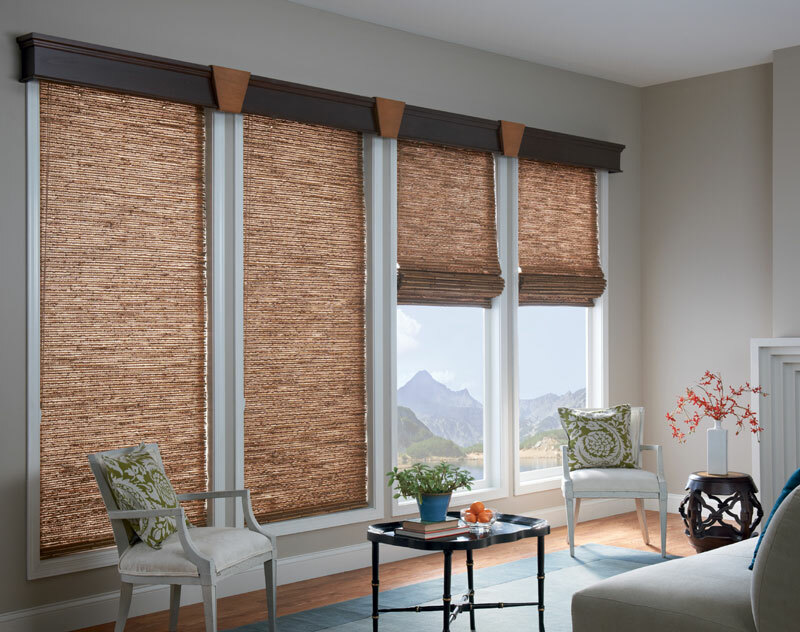 There are many custom or pre-designed options from cornice boxes to wood valances to choose from, which is why Horizon top treatments are one of our favorite 2015 window treatment trends. In this post learn about how cornice boxes and valances can be decorated, cut, adapted, and designed to be the perfect compliments to your stylish home. For inspiration to design your curtains, see some of our favorite fabric options below. Cornice Box or Valance: Which Matches My Design? 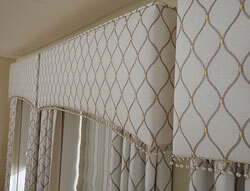 Watch this video to see the difference between a cornice box and valance. O’D McKewan of 3 Blind Mice explains using the Horizon Window Fashions display at the 2015 International Window Coverings Expo. Get cute with custom cornice boxes! These adorably simple top treatments add the perfect touch to your draperies with custom or pre-made designs from Horizon Window Fashions. With hundreds of different fabrics and custom detail box shapes, they are a fun addition to compliment your style. Pro Tip: With custom cornice boxes you are in full control the design and look, all the way down to the smallest trim. The flexible padded wood frame can be sharp and crisp or curved and soft, the possibilities are almost endless. The padded cornice box has a sleek and neat design to enhance the room’s style, without going over the top. Let your imagination run wild, by designing an elaborate cornice box that fits your current interior design style. As you saw in the video, customers took a simple square bottom cornice box and transformed into a fabulous custom-detailed top treatment. There are no limits to the designs you can create, we are available to help you find the right one for your home! If the cornice box seems over top for your vision or if it is just not what you are looking, there are other stunning options for covering the top part of your window. Valances are a great alternative to the cornice box design and are available in soft fabric valances or smooth wood valances. Soft fabric valances, highlighted at the beginning of the video, can easily be designed to fit your existing decor. You can customize them however you would like with different pleats, styles, trims, making your room unlikely any other. Like other top treatments you can create custom designs or use pre-made templates. Wood valances add that extra special touch to existing blinds and shades. There is no better finish to a room than a nice smooth wood finish. Although it may be a more expensive option, wood valances give you that crisp, natural look you’ve been looking for. At 3 Blind Mice, we have over 400 different options to choose from for your cornice box fabrics. Shown below is not a complete list but includes a huge selection of options from Horizon Window Fashions. You can use any fabric you wish and can create custom designs that are elegant, sophisticated, or bright to match your home’s decor. Let Our Designers Help Find the Right Top Treatment for Your Home! Speak with one of our creative designers and find the best custom curtains and drapes to match your home. You can also stop by our showroom to view the large selection of window treatments we install. Love the cornice boxes with the contrast banding on the bottom. It really makes an impact on a room!